Nike Air Max 270 is an everyday shoe that combines style and comfort. The name 270 comes from an internal Nike epithet for the Air Max 93, which referred to the 270 degrees of visibility in the air unit. The shoe features a minimalistic upper and a visible Air Unit, which is a zest of the model. It is the tallest Air Unit in history, its height is 32 mm. The shoe comes in bold colorways and it comes in men’s, women’s, and kid’s versions. The shoe was released on February 2nd and the Flyknit version drops on March 22nd. This lightweight and form-fitting men’s shoe produces a trampoline-like effect so that you enjoy every step. The shoe construction flexes with the foot, the upper is breathable and comfortable. An air unit in the heel ensures a super soft ride and a solid rubber outsole gives good traction. A new Nike model is going to be on March 22nd, 2018. The shoe will feature a Flyknit upper so that it is durable, breathable, and stretchy. An asymmetrical lacing ensures a snug fit, a plastic heel counter contributes to the overall stability, and flex grooves in the rubber outsole promote a natural stride. 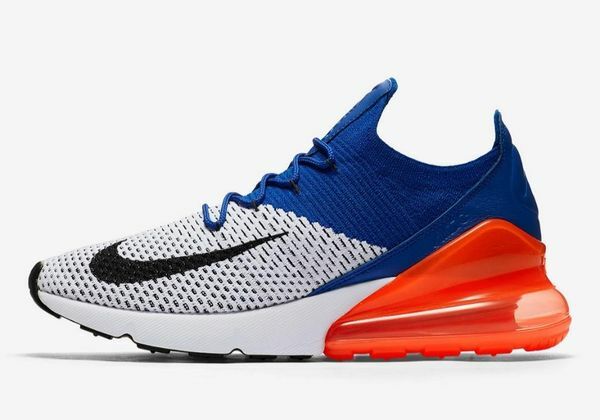 This men’s shoe joins the lineup of colorful-heeled Air Max 270. Aside from looking bold, the shoe is pretty functional. The shoe is equipped with Nike’s largest Air heel unit to date. Besides, the shoe has a perforated upper, a sock-like construction which makes the shoe form-fitting and comfortable, a heel pull tab for enhanced comfort, and a rubber outsole, which is both grippy and flexible. Nike Air Max 270 white is a good-looking women’s shoe. This is a new generation of Nike Air Max shoes which are perfect for everyday use but you are unlikely to run a marathon with these sneakers on feet. Featuring a knit upper with no-sew overlays, a dual-density foam midsole, a solid rubber outsole, and an asymmetrical lacing, the shoe is supportive, flexible, and comfortable. With these shoes on feet, every woman will be in the spotlight. The Nike Air Max 270 has received the highest in the history of the brand cushioning Air Unit under the heel – 32 mm. The shoe has perforations all over the upper so that it is breathable and stretchy. The tongue and the collar are padded, the heel tab promotes easy on and off, the outsole is grippy and stable. Do you want to get the feeling as if you are walking on air? The shoe makes it possible. This is a brand new model for men, however, in its silhouette, the design elements of the iconic sneakers of the past Air Max 180 and the Air Max 93 are tracked. The sole is responsive and grippy, the upper is stretchy and breathable thanks to the perforations, the Air unit is flexible and cushy, and the heel counter adds stability. In this shoe, you’ll find not only an appealing combination of two contrasting colors – white and blue. Air-Sole comfort, provided by the shoe, gives you a feeling as if you are walking in the clouds. Aside from being flexible and cushy, the shoe is stable due to the heel counter, a sock-like construction, and a lace-up closure. This new model features a Flyknit upper, which makes the shoe more durable, more flexible, and more breathable. The shoe is designed for everyday wear and it provides the necessary comfort, cushioning, and support the person needs every day. The Air Unit under the heel is cushy, responsive, and supportive. Men will love this model because it looks awesome on feet and provides modern functionality. Even if you walk for many hours every day, you won’t suffer from blisters and discomfort because the upper provides sufficient ventilation, the collar is padded, and cushioning is top-notch. Nike Air Max 270 comes in a Dusty Cactus color scheme, which is loved by many men for its sleek and stylish look. Everything in this model is made for a smooth ride and superior comfort: a breathable mesh upper, a secure lining, a padded tongue, collar, pull tabs, soft but rigid rubber on the outsole and a cushy and responsive Air Unit in the heel area. Released in February, the model became a win-win option for all men, who value style and comfort. Featuring a revolutionary Air Unit in the heel, a mesh upper with no-sew overlays, a plastic heel counter, and an asymmetrical lacing, the shoe provides excellent comfort and support you need for everyday wear. All fans of total black looks will benefit from incorporating this item into the wardrobe. Covered in black across its entire mesh upper and rubber sole, the shoe has a Nike’s biggest heel bag in a glossy black finish. Thus, the model provides a super-soft ride that gives you the feeling as if you are walking in the clouds. This new member of the Air Max family is both functional and aesthetically pleasing. By redesigning a visible Air Unit, a Nike Team has found a new way to captivate the buyers. The design of the model is inspired by the Air Max 93 and the Air Max 180. Nike Air Max 270 features a brand new, sleek, engineered mesh upper. It is stretchy, durable, and breathable. A Flyknit version will be released on March 22nd, 2018. A Flyknit upper is more durable compared to its counterparts. No-sew overlays in the toe and arch areas add support and an asymmetrical lacing system ensures a snug fit. The shoe has Nike Swooshes on the lateral side, on the tongue, and in the toe box area. A one-piece tongue and the collar are padded and there are pull tabs for easy on and off. The insole is soft and it gives a higher graded comfort. The midsole has a dual-density foam. One foam springs you into the next step and another foam eases the gait cycle. Air sole and outsole units don’t have any interruptions and they provide superior cushioning and a responsive feel. In this shoe, Nike has used the tallest Air Unit in history, its height is 32 mm. Its main goal is to provide the best cushioning ever. This massive U-shaped Air Max unit is seamlessly integrated with the transparent plastic heel counter — this should offer stability from outsole to heel. Also, there is a newly designed “air” logo and the heel cup matches the Air Unit. As for the outsole, it features rubber pods and they give good traction. Besides, EVA foam improves cushioning and flex grooves enhance flexibility. Some reviewers say that you should go a half size down from your normal Air Max size. Thanks to the mesh upper, EVA foam in the outsole, and an Air unit in the heel, the shoe is pretty lightweight. Dual-density foam in the midsole gives sufficient cushioning and flexibility, an Air Max Unit is 32 mm – it is the tallest Air Unit in history. It provides superior comfort and cushioning. A new engineered mesh upper is breathable and it prevents sweat and irritation. There are models that feature a Flyknit upper, which is breathable, flexible, and durable at the same time. The outsole is made of rubber, it has rubber pods and flex grooves which not only improve flexibility but also contribute to traction. A mesh or Flyknit upper is flexible and it allows the natural foot’s motion, a dual-density foam in the midsole and EVA foam in the outsole also make the shoe flexible. 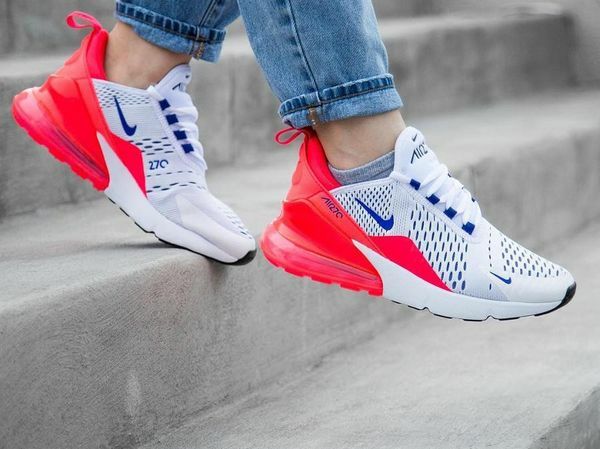 Nike Air Max 270 provides superior comfort thanks to a soft removable insole, a breathable and stretchy upper, a dual-density midsole, a stable heel counter and an incredible Air Unit that offers superior cushioning. The shoe is flexible, cushy, and comfortable but it is supportive at the same time. The upper and an asymmetrical lace-up system provide a sock-like fit, the outsole is grippy and stable and a heel counter improves support and stability. The shoe provides a sock-like fit and an asymmetrical lacing system keeps the foot in its place. However, the shoe runs big and it is recommended to go a half size down from the normal Air Max size. Flyknit Technology means that with the help of a special loom, fully controlled by a computer, a solid one-piece construction is sewn. But the distinctive feature is that this construction is sewn with the help of one thread. The upper gives a feeling of the second skin because it is featherweight, form-fitting, and virtually seamless. Nike Air Max Technology has a distinctive feature – there is a visible air unit in the heel. This technology gives full-length impact protection, it minimizes shock and gives top-notch cushioning. Created with an all-day comfort in mind, this lifestyle sneaker will provide comfort, cushioning, and support you need every day. The hallmark of the model is a visible Air Unit, which is the biggest in history – its height is 32 mm. The model comes in bold colorways which are loved both by men and women. If you need a perfect lifestyle shoe which can be worn for different occasions, Nike Air Max 270 is your ultimate choice.